Currently: wondering how I can spend my Thursday face down in a cupcake. I’d probably pay you to make these cupcakes for me today. Yes. That is correct. I’d pay YOU to make my recipe. The sleep deprivation is causing me to loooooose my marbles. Sidenote: they are already lost. Say hello to the second best combo in the universe: chocolate and coconut. Only second to chocolate and peanut butter, but could I BE more of a broken record? I don’t know, sometimes I think toast and cheese are a close second too. Maybe let’s pretend we’re just talking about sweets. No savory allowed right now. So in that case, it’s always these flavors. These babies are downright DREAMY. They are so super fluffy. That’s a thing. The chocolate cake isn’t hurt-your-teeth sweet and it’s made with coconut milk. Light and airy. It’s just… GOOD. Forgive me. That’s the only thing I can tell you about it. Good good good. There are mini chocolate chunks inside too! Of course. Always. Cannot do without. In a complete cop-out moment or a complete brilliant moment – I’m not sure which yet – I topped them with some simple coconut whipped cream. You know this. I live for it. Dolloped on sweet potato pancakes. Oh oh and on lemon cupcakes too! I guess I’ve kinda done this before. Real life: half the time I make the coconut whipped cream because it’s so pretty and instagrammable in gorgeous dollops and on top of the whisk. And now I’ve used “dollop” twice in the last few paragraphs. But really, how many whipped cream whisks do you see on your insta feed? I vote 435. To be frank, we totally downed these cupcakes in, like, a day. No no. Wait. More like a few hours. I mean, a bunch of us did, not just Eddie and I. Though we probably could have done that? In a bowl, stir together the flour, cocoa powder, baking powder, soda and salt. In the bowl of your electric mixer, beat the sugar and egg until slightly fluffy and combined. Add in the oil and melted butter, beating until combined. Add in the extracts and beat on medium speed, scraping down the sides if needed. Add in half of the dry ingredients while beating on low speed. Add in the coconut milk, continuing to beat on low speed then add in the dry ingredients. Beat until a smooth, silky batter forms then stir in the chocolate chips with a spatula. Use a 1/4 cup measure to evenly fill the liners 3/4 of the way full. Bake for 18 to 20 minutes, or until the tops are set. Let the cupcakes cool completely, the frost with the coconut whipped cream and top with the chocolate chips and coconut. Take the cans of coconut milk out of the fridge. Open the cans and discard the liquid (save it for a smoothie! ), then scoop the firm coconut meat into the bowl of your electric mixer. Beat on medium-high speed until completely whipped and thick. Beat in the sugar and extract. Set the bowl in the fridge until ready to use. SO FLUFFY I’m GONNA DIE. Ooh these look super delicious! I bet they’re so yummy inside with the coconut milk and chunks of chocolate too! I do not need to lose my marbles to be all over this recipe. I made some coconut butterscotch cookies this week with coconut flour; so you can see I am in need of coconut overload! 3 can of coconut milk! I am in love Jessica. coconut butterscotch?! that sounds wonderful. These do look so fluffy that I could die. Let me know if you find someone to hire to make these for you. I might need them myself! these look AWESOME. the hubs isn’t the biggest fan of coconut, but i bet he could be persuaded to enjoy these. i mean…who wouldn’t love them!?!?! These are so cute! And I adore the little flakes of toasted coconut on top. Thanks for sharing! I am sure these would turn around even an avowed coconut hater. These are the prettiest little cupcakes! I see some whipped coconut cream in my near future. Do you have any experience with whipping light coconut milk? I have some leftovers in my fridge right now. Clearly it won’t taste as good as the full fat version but I’m wondering if it’ll even whip? unfortunately it doesn’t work with light coconut milk – at least in my experience – you need the full fat so the fat separates from the water in the can. i use light coconut milk a lot in other recipes, but it just won’t whip! So dreamy — and the coconut whipped cream — SOOO FLUFFFFYYYY ! Ahhh! So delicious! I’ve never made coconut whipped cream before and I don’t know why. It really needs to happen. Just think of sleeping in a soft cozy bed like these yummy cupcakes! Nap while the baby naps……..
who doesn’t need a cupcake. Great flavor combo! I made coconut whipped cream about a week ago for the first time and I may never use regular whipped cream again. So good!! I made it from a can of pure coconut cream (I found it at Trader Joe’s) and, as the saying goes, the more the merrier! I refrigerated the can overnight because I read a few recipes calling for that, but since they were using full-fat coconut milk (and not pure coconut cream), do you think it’s still necessary to refrigerate the coconut cream over night? i loooooove that stuff from trader joes too! i honestly haven’t tried whipping it because i always end up eating it from the can with fruit and stuff. i bet you could try whipping it at room temp – or even just refrigerating it for an hour or two?? Minimalist Baker has a recipe for coconut whipped cream using trader joe’s coconut cream! Coconut and chocolate are two of my most favorite things. These look incredible and now I want to make them immediately, just because. Question- what brand of full-fat coconut milk do you buy? I’ve tried to make coconut whipped cream before and failed. It wouldn’t whip up. I read on Oh She Glows that it has something to do with guar gum in some brands? Would love to know what brand you like! i have read that too! i use the thai kitchen organic full fat – which does have guar gum – and it still whips for me as long as it’s right from the fridge. i’m not sure why – or maybe it will just be thicker and stiffer if there is no guar gum?? here is an awesome post on brand comparisons! 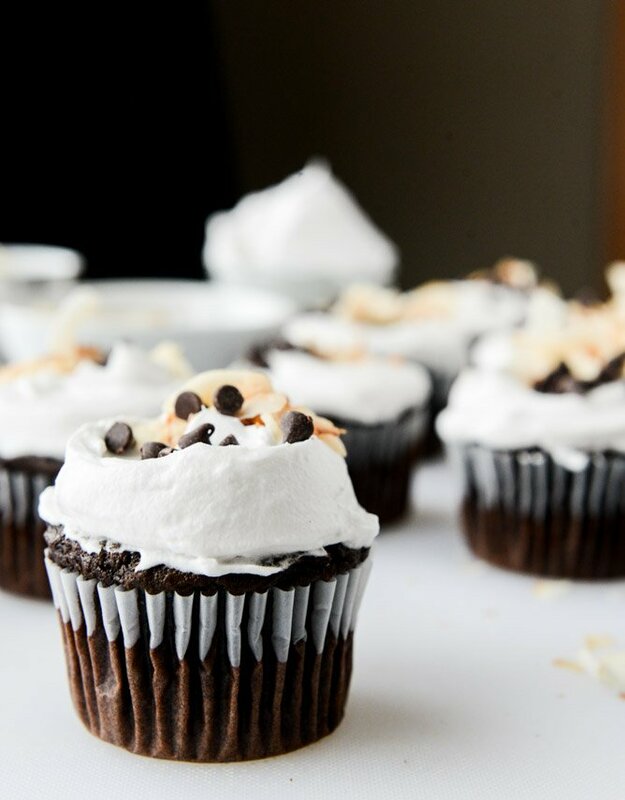 LOVE that the cupcakes have little chocolate chips in them, and love chocolate + coconut! Stunningly perfect! I don’t fancy myself a coconut person in general, but there’s something about coconut cream and chocolate together that I love! These sound delicious, and I love how fluffy and white and beautiful the coconut whipped cream is! They look so delicious. Coconut and chocolate — one of my favorite combinations! Have to try it sometime soon! I don’t like coconut and yet, somehow, these still sound absolutely wonderful! I am a good baker (until we get to cupcakes). For whatever reason, I always feel like my cupcakes are dry. I’ll have to try this recipe! I just made a whole-wheat Nutella bread that was fantastic! Check it out! Gorgeous! I definitely need to try my hand at these! YUM! Um hello gorgeous delicious cupcakes! Can. I. Have. It. One question – could I use coconut oil for the 1/3 cup oil? I’m totally making these like yesterday. while i have baked with coconut oil (mostly in quick breads and cookies!) i was hesitant to try it here because i was afraid that the cupcakes wouldn’t be as light and fluffy since the oil is solid at (most) room temps. so i think that you *can* use it – just not sure how the texture would turn out. if you try, i’d probably use 1/3 cup solid measured out, then melt it. They’re stunning and I cannot believe you have a newborn and made these, or reading between the lines with the I’d pay you part, hopefully you made these before baby. Either way, they look fabulous, pinned, and they are SO you with the flavor combo! I don’t know where to begin with these. They look and sound amazing. Like, make-them-in-the-morning-and-eat-them-all-before-my-husband-gets-home-and-pretend-nothing-happened amazing. Yep, those are insulin worthy! I was lucky because my daughter slept ALL THE TIME. Like she was awake only a couple hours a day for the first few months of her life! I neeeed these immediately! Second trimester justified. hahahaha the first line of this post is pure gold. All Thursdays should be spent face down in a cupcake!! And this cupcake recipe in particular….dang, how did you not eat all that coconut cream with a spoon?? These look so perfect and a little dense, maybe? I love a sort of dense cupcake and I always love a chocolate + coconut combo. PLUS, ever since Casper was born I’ve had a wicked sweet tooth. It cannot be contained! Oh wow. These look incredible! I will pay you in exchange for the whipped cream whisk! Chocolate and coconut…most definitely. And I just discovered the whole concept of coconut whipped cream last year…amazing…and on top of this cupcake? I love it because it’s not a super sweet frosting…perfect! I would like to be in a bathtub full of these cupcakes, please! I’m all about the combo of chocolate and whipped cream. And coconut whipped cream? UGH, YES! Coconut and chocolate is probably first for me followed by chocolate and peanut butter. Just don’t tell! I would pay someone to make these cupcakes for me too. If only my mom lived closer!! These look excellent!! Plus, when you’re sleep deprived, you just live on treats. I had a winter baby too…I sympathize. I think I ate Christmas cookies only for the first two weeks of his life! Say the word coconut and I am in!! Sounds wonderful. ugh, these look so ridiculously good. I must say that my favourite thing about your blog (besides the sinful desserts), is that when you link to your other recipes in a different recipe, or when you do ‘Currently Crushing on’ links, it opens a whole new window. So i don’t have to exit the current recipe! Very first world, but very amazing! These cupcakes look SO good! And I would totally make these for you! These look so amazing! I am a huge fan of chocolate and coconut…and pretty much chocolate and anything! Yummm! Thanks for sharing!